A human being has never managed to stay too far from the darkness. What we really have to fight for is the light. The day brings you light, the night brings you darkness. Having your hands cover your eyes drags you into darkness in a second. But reaching light with your eyes closed demands the greatest discipline. The kind of discipline only found in a monk. The ever so enlightened monks – who fear nothing, who have mastered not to show any reactions to the behavior and acts of those who surround them. Letting go the urge of reacting to something can lead us all closer to that inner and ever so shining light. Unfortunately we are not monks. Pity how we do not bother to practice any such discipline. We are sadly mistaken simple people, who is rightfully referred as “human being”, who has never managed to stay too far from the darkness. There was a time when I would write a blog here after skipping a few days, and feel like “Yes, I am back”. But now, after having to update 4 different blogs publishing writings of different genres, trying to find what genre of writing I can swim into without having a fear of sinking some day, it is tough to keep track of it all. Good thing among all of this is the battle to keep writing continues. It only tells me that I haven’t given up yet. 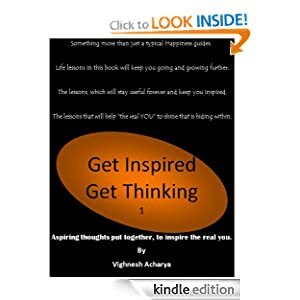 I haven’t given up after the disappointments from many of my friends who said are waiting to read “Get Inspired Get Thinking” book but have never bothered even downloading it for a dollar. On the other hand, there was a hope given from all the strangers who continue to send me positive feedback through blogs or e-mails. For the same I must continue trying. This one is for all those, who are forever hopeful to reach the light or die trying. Few days back I was at the party with my wife. Including my uncle’s family, we were talking about classical Indian music because my wife has learned and practice vocal Classical Indian music. We were talking about an android application that is on my phone that is for playing a piano with your touchscreen. My uncle requested my wife to play that piano and so she did. Now, that’s the line we are sticking at. So much weight that truth holds. In chapter 2 – never compare of “Volume 1 of Get inspired Get thinking”, my e-book I mentioned a similar thing. There is no point comparing and having yourself feel bad/down. Now, just to add another lesson to it, something that my uncle said, there always will be someone better than the other. So, do not ever feel bad for not being as good as others. Why do we feel that we are not as good as others? Why do we not concentrate on the fact that we may be better than someone else at doing something. Everyone is not the same. Everyone is not the strongest. Everyone is not the weakest one either. Never underestimate the power of anyone, including your own self. Some of my friends reading my blogs ask me how I get the ideas to write. I just try keeping my eyes and ears open. Things happen right in front of you. Every day, every new situation is filled with a lesson, so be a good observer and be a good learner. By being a good observer and a good listener you will be inspired and you will be able to inspire all around you. so Stay Inspired, Stay Thinking. A romantic/suspense fiction coming your way. If all goes well it will be there right when 2013 Valentine’s day is around the corner. Till then will keep popping up here when I can, with more thoughts and more inspiration. Here is the image I saw on Facebook 2 days back. I was laughing hard reading what’s written next to the cat picture. Then it got me thinking, besides being funny doesn’t it all make sense? Why should someone put limit to life. There is nothing wrong in being someone else. Well, it will be only if you don’t know your real self and try to copy someone. But there is nothing wrong in aspiring to be something more than you are. Wonderful lesson in this picture I found. That pipe and that cat – I don’t know really who is trying to be what, HA HA. For sake of this cat and the pipe trying so hard to inspire the world, we should all remind ourselves right now that we are capable to do beyond anyone’s imagination. You are filled with the strength to move the world. You are capable of doing what had been waited to be done, because no one else was good enough to make it happen. Start your day strong, stay strong, finish stronger, be a legend, live forever. For more daily inspiration click here. Instantly available on your screen. And Remember the Cat lesson. You can do better than they think. My first e-book is coming out soon. For more updates subscribe by entering your e-mail, or simply click on FOLLOW button. “Get Inspired Get Thinking” promises you to keep you inspired n keep you thinking for good. This is volume 1 of Get Inspired, Get thinking that will be published n available to buy soon. I am already working on volume 2 to bring you something even better. My dream of writing something inspirational has come to reality only because of all your support and it was always you the readers, who kept guiding me to strive for better and bigger. You – the readers always kept me inspired to keep writing. I am very thankful for that. 2nd October, 1869 he was born. Born to do something great. He was not an ordinary man like you and me. He just looked ordinary. He was always under estimated and misunderstood for his peaceful and non violent ways of fighting for justice and for what was right. He did so all his life, what we cannot do for a few hours a day. This one is for Mahatma Gandhi, who played a vital role in bringing freedom to India in 1947. Freedom – for what he sacrificed all his life, without knowing that our generation is only going to misuse it to some extent. For most years of his youth, just like us he stole, he begged, he suffered, he cried…..but he corrected his mistakes with his efforts by practicing honesty and fighting for what was right and what was for the GOOD of all. It is our turn to repay it, by turning back if we are headed the wrong way. Today seems like a perfect day to continue what he started. This one is for Mohandas Karamchand Gandhi, who proved that turning back from wrong way and choosing the right way is possible. This one is for Bapu, who gave us HOPE forever that greatness can be exhibited from any walk of life. (Please share if you agree). – Vighnesh Acharya. Some believe, “God is nowhere”. If you shift that W in no where adding a space then it reads, “God is now here”. Feel the presence of God, and everything will feel smooth and under control. This blog is inspired from couple of signs I read in this week. I am usually a person, who observes what is going on and try to relate one thing to another and try to read the sign. It was last week, I took my wife to a “new immigrant evaluation” program. She was to give some English language test there. After the test was over, I had a chance to talk to the examiner. The chat was interesting and I told the examiner how I enjoy writing and catch simple mistakes in English I use, as I keep writing more everyday. I was touched by what she said. To some of you it may sound a bit stupid, but I thought over what she said over and over. It made a lot of sense when I lately tried it a few times. I am not too sure of what I wrote and what I am writing is any good and if my words have the impact I wish I can put into it, but lately every time I sit down to write, I feel more and more confident after I have prayed to God to help me unleash the most inspiring thoughts to generate more good and more positive out there. Something similar came to my way when I put my mp3 on 2 days back. I mix different genre of music in my play list. While listening to 2pac n Elton John’s “Ghetto Gospel” soundtrack, I found a line something similar. That was part of 2pac’s rap in that track. Like I mentioned earlier, I read signs. I have a habit of observing and relating one thing to another, trying to get the bigger picture. Well, that is just me. But if you ever feel down and feel God is nowhere, try convincing yourself to believe, “God is now here” and God will show up. He won’t show up in his direct form, but he will show up in your actions and in your thoughts indirectly making you feel his presence. My ebook is coming out soon. I know I bragged about it long and was away for too long. Too bad of an image to create, when you have followers. But now my cooking exams are clear, and back to writing. the ebook is ready to be edited and to go to amazon. Will see you with more very soon. Keep reading and spreading the germs of positivity and try inspiring someone; you may just make their day or may be their whole life, you never know. Why to worry? – something that my father used to tell me. He would often find us – kids, worrying about something that may be happening soon; something that we are afraid that is coming up. In my case, I would be mostly worrying about tests in school or visiting a new place where I would have to deal with strangers or something as simple as having to wake up early next morning. I used to be the one (using my own example I am trying to relate to many people out there who think or act like I used to) who would be deep down busy worrying about silly things that may happen. This exactly is an issue that will make you lose your today. You are letting your “right now” slip out of your hands by worrying about tomorrow. Half of the terrible things we worry about do not even happen, or may be more than half of them. So, do not forget to live this moment. Do not get too busy worrying about what is happening tomorrow. When you are busy enjoying your weekend, please do not forget to be kind; be good – to others. There are many of us you will notice who has more than what they need, while there are others who can merely dream of what is our basic needs. These needs – absolutely so basic that we barely consider it something to be thankful for in our everyday life. On the left is a picture of Mother Teresa, with a beautiful thought we all should ponder upon. Another story of an Indian Chef, Narayan Krishnan caught my eye on facebook in the past week. A normal looking human being with an extra ordinary observation skill. Here is a link you can use to watch the video on Youtube from CNN report. All these people are trying hard to keep this world spinning round nice and smooth. I think its time we all should join them by doing whatever is under our power. Admitting to their beliefs can even help by spreading the word that such unsung heroes out there exist. These are the heroes who still light the candle of hope in the storm of world that is turning meaner. They are keeping the hope alive, that there is still something good out there. Because we are so busy, trying to make more money and finding our dream job or buying a new car, it is absolutely acceptable to forget about people who has nothing to hang on to. But it is our duty to help those heroes to keep going, these heroes who are there to dedicate their life spreading goodness around. We can at least be a little inspiration or support to these heroes in order to help the poor ones indirectly. All this just for sake of “KINDNESS”, kindness that can start anywhere, anytime and by anyone.